SANA’A, YEMEN— The U.S.-backed, Saudi-led coalition has devastated Yemeni lives on all fronts: beyond the airstrikes and cholera, thousands of innocent civilians, including children, have died due to a lack of access to critical medical care a result of the air, sea, and land blockade imposed on Yemen since 2015 when the war began. Eleven-year-old Ali al Saqaaf began to experience paleness of his skin in early ِApril. His father, Abdulkareem, rushed him to the Hospital of Science and Technology in Yemen’s capital, Sana’a, where doctors discovered Ali was suffering from blood cancer. After further tests, Ali`s family was shocked when they learned he was suffering from leukemia. Supported by the United States and other Western military powers, the blockade on Yemen became a fertile environment for infectious disease and chronic illnesses. The World Health Organization (WHO) says there are around 35,000 people suffering from cancer alone in Yemen and that some 11,000 new cases are diagnosed each year. Head of The National Oncology Center in Sana’a, Ahmed al-Ashwal, told MintPress that these figures are huge in relation to the size of Yemen and its population of 23 million. To make matter worse, over 1,250 days of near-constant airstrikes by the Saudi-led coalition have reduced Yemen`s hospitals and clinics to rubble and short-circuited its electricity service, while a ruinous blockade of Yemen’s ports has depleted the country’s supply of food and life-saving medicine. Another patient, 11-year-old Mohammed al-‘Ajari, who survived last month’s Saudi attack on a school bus in Dahian, is suffering from critical fractures around his kidney and pelvis. A doctor told MintPress that Ali`s kidney is failing due to toxic fragments: “We do not have the medical treatment and life-saving equipment [to save him],” Dr. Fuazi lamented. 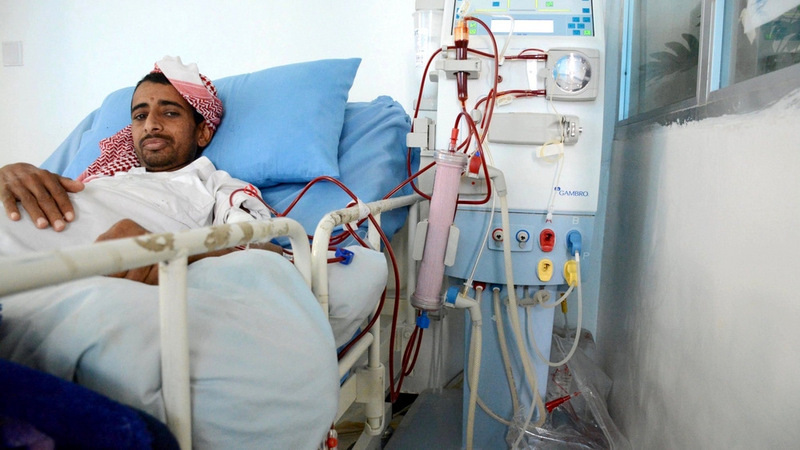 Life-saving treatments are indeed seldom available inside Yemen, as most of the country`s medical infrastructure has been destroyed since the Saudi-led coalition`s war began in March of 2015. According to the Legal Center for Right and Development, The U.S.-backed coalition has destroyed 316 hospitals and health centers. According to the United Nations Office for the Coordination of Humanitarian Affairs (OCHA), 7,000 Yemenis traveled abroad from Sana’a Airport alone each year to access medical treatment abroad but, for the past 24 months, that number has skyrocketed to an estimated 20,000 Yemenis a year. Yemen’s Health Ministry said in a press conference Tuesday that hundreds of Yemeni children are suffering from various disabilities as a result of direct coalition bombing of civilian targets. Many of the disabilities could have been treated if the patients had access to treatment abroad, but the closure of the Sana’a airport for over two years has prevented that. The Health Ministry also confirmed that the Sana’a airport closure led to the deaths of tens of thousands of children as a result of their inability to travel abroad for treatment not available in Yemen. The Saudi-led coalition forced the closure of the airport in August, 2016, also depleting Yemen’s supply of life-saving medicine. Yemen’s Ministry of Health called on the United Nations General Assembly to expedite the rescue of Yemeni children through all possible channels, including the dispatch of aircraft loaded with medical supplies, and to work to transport patients for treatment abroad through Sana’a’s airport. There are generally two UN humanitarian flights into Sana’a each week, but the flights are not available to Yemeni citizens. The flights that do take to the air are being forced to land at Saudi Arabia’s Bisha airport, located in the south of the Kingdom, and are subject to inspection by coalition forces. No aircraft is able to land without permission from the coalition. Many patients, including Ali, resort to traveling through areas like Marib and Lahjj, where fierce fighting between Yemen’s army and the Saudi-led coalition is taking place. Reaching Aden’s airport or Seiyun, 600 kilometers east of Sana’a, means driving for nearly 20 hours. The trip costs around $100 and many of the patients who can manage to afford it don’t survive it. Saad al-Hajj traveled by road for 24 hours last week seeking treatment for his mother who was suffering from liver failure. She died during the journey, 12 hours before her flight out of the country was set to leave. “If the Sana’a airport was open I could have saved her,” Saad told MintPress. Some patients traveling to seek medical treatment have been prevented from returning home and others detained by the coalition under the pretext of supporting the Houthis. Well-known Yemeni doctor, 70-year-old Mustafa al Mutawakil, was recently arrested by the Saudi-led coalition while returning from Morocco, on charges of supporting Yemen`s resistance and opposing the presence of the United Arab Emirates in Yemen.